#BookReview of Waterkill by Mark Donovan. 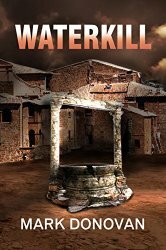 Waterkill is the second book in the Dave Henson series and a Terroristic TechnoThriller by Mark Donovan, author of Nano Surveillance, book 1 in the series. In Waterkill, we have Dave Henson going head to head with the Al-Qaeda terrorist Aref Zarin, a techno savvy villain with a new form of terror weapon that makes nuclear weapons obsolete. Along the way Henson runs into an old friend with a new mission and travels from Germany to Iran and around the world. All in an attempt to stop the deaths of over a million innocent people. When Mark offered the book for review I couldn’t say no. It’s a paperback, not an ecopy and a thriller. How could I say no? The first chapters were a bit slow and hard for me to get into at first. So I stopped. I don’t force myself to read a book or it’ll be a bad review. Then I decided it was time to read and emailed Mark I was getting ready. He told me he had hired a professional editor who spent over a month editing the book and that thrilled me. I read the book, then looked at the edits and I have to say, it was money well spent and Mark has done his work justice. The story is fast paced after the initial chapters setting up the story. You have the terrorists, the special forces teams, tech gadgets, the beautiful but not helpless damsel in distress. Did I mention gadgets? Mark brings some serious tech knowhow to the storyline. If these things exist, and I am not doubting some do, there is some seriously cool stuff going on in the world. Mark also does a good job of creating a sense of urgency in the story and an ending that just makes sense. He takes the hot topics of today and handles them very carefully and does a great job not overly sensationalizing them to get a cheap punch for his story. You learn a little about people in this book that may help open your eyes just a little bit.